Welcome to Issue 15: The Whittler! This is the first issue to be published in the 2015/2016 academic year, as well as the first issue to be published under the new editorial team. We are so incredibly proud of what we have achieved so far, and consider Issue 15 to have been one of the best starts to a new year that Flash has ever seen. This, of course, we could not have done without the help of the Lancaster University English Department, nor without the hard work of the editorial teams of previous years. Their passion and ambition has led Flash to develop in so many ways, from hosting launch parties, presenting awards and holding grand events such as last year’s The Uncanny. For the time being, we have to keep quiet about our plans for the next year, but we can assure you that we are so excited to reveal them when the time comes! 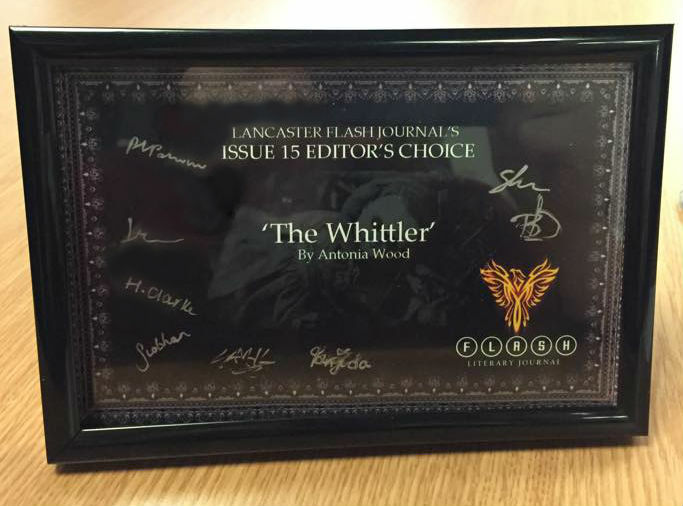 Without further ado, we are proud to present Issue 15, named after The Whittler by Antonia Wood, who has been awarded with the editors’ choice plaque below. by Antonia Wood, with commentary from Sianne Fraser. “The Whittler is a dark and suspenseful piece of short fiction. Antonia’s writing style is as delicate as the titular character’s whittling, and thus successfully draws a genuine reaction of horror from the reader once the character’s true ambitions are realised”. by Konstantina Sozou-Kyrkou, with commentary from Tanjida Hossain. by Melissa Shode, with commentary from Betty Doyle. by SJ Callender, with commentary from Siobhan Mitchell. by Srishti Kadu, with commentary from Rebecca Parkinson. by Siobhan Diston, with commentary from Lauren Wood.